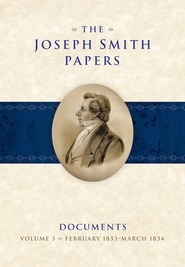 This volume of the Joseph Smith Papers Project presents the minutes of a Church organization called the Council of Fifty. The minutes, which have never before been publicly available, will form the only volume of the Administrative Records series. "Council of Fifty, Minutes, March 1844-January 1846, the latest addition to the monumental Joseph Smith Papers Project, opens a wide window onto a previously shrouded, but extraordinarily revealing, part of Mormon leadership and life during what were arguably the most turbulent and treacherous months of the church's history. Students of these pivotal events will be forever grateful for the insights and understanding they will find in these pages." "The publication of the Council of Fifty minutes as the first volume of the Administrative Records series in the Joseph Smith Papers can only be described as a triumph. The new volume is sure to be celebrated for its annotation and editing, another excellent addition to the papers project. But the minutes are also a triumph of the new transparency policy of the Church History Department. Over the years, the council minutes attained almost legendary status, as a trove of dark secrets sequestered in the recesses of the First Presidency's vault. Now the minutes are to be published for all to examine." "The Council of Fifty minutes are a treasure trove to anyone wanting to understand the last days of Joseph Smith, the martyrdom [of Joseph Smith], the last twenty months in Nauvoo, the revocation of the Nauvoo charter, the plans for exodus, and the apostates and renegades who inflicted so much damage upon the Saints. . . . They add a fabulous richness to our understanding. . . . The work of the editors places every matter of importance into excellent Mormon, American, and international historical context. . . . This is a splendid work. The importance of these Council of Fifty minutes is reflected and enshrined in the fine work of editing this band of scholars has put into them." "What I found in the Council of Fifty minutes was in fact engaging and even sometimes riveting. It was as if I had a front row seat as I watched the tragic unraveling of the Mormon community at Nauvoo. I felt the depth of council members' despair over a continued inability to find judicial, executive, or legislative justice for the wrongs they had endured, including the murder of their leaders Hyrum and Joseph Smith. I was reminded of Alexis de Tocqueville's assessment of one of the inherent weaknesses he found in American democracy, something he called the tyranny of the majority. The Council of Fifty minutes made that real to me in a way that academic histories of Mormonism have not been able to do." Ronald K. Esplin is the managing editor for The Joseph Smith Papers. He received history degrees from the University of Utah, the University of Virginia, and Brigham Young University. From 1972 until 1980, he was part of the History Division of the LDS church's Historical Department, with assignments both as a researcher and writer and as an archivist. He moved to Brigham Young University in 1980 when the History Division was transferred there to become the Joseph Fielding Smith Institute for Latter-day Saint History. From 1986 through 2002, he served as managing director of that research institute and as a professor of church history and doctrine. From 1988 to 1991, he served as one of the editors for Macmillan’s Encyclopedia of Mormonism. Most of his publications have involved Brigham Young and early Utah or pre-Utah Mormon history, including Men With A Mission: The Quorum of the Twelve Apostles in the British Isles, 1837–1841. Many of them also concern Joseph Smith and early Latter-day Saint leadership. Jeffrey David Mahas is a research assistant for the Joseph Smith Papers whose work will appear in the Documents and Administrative Records series. He received a BA in history from Brigham Young University and worked for two years as collections manager of the L. Tom Perry Special Collections at BYU. He is currently pursuing a master’s degree in history from the University of Utah.